fatburn.com is an online weight loss journal that operates on the basic premise that good health requires balanced nutrition combined with exercise. You enter the food you eat, the exercise you perform, and information about your daily habits, and the Fatburn System will calculate how much weight you are losing, day by day, week by week. 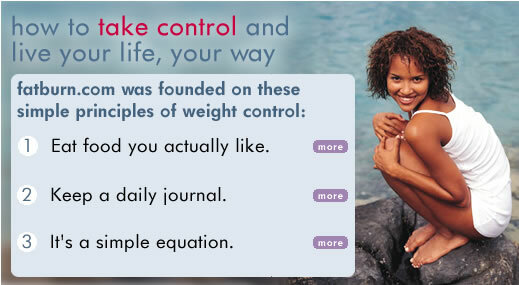 • Live life your way: We give you the control to be the shape you want to be. We give you a flexible system so that you can adjust your foods and exercises to suit your own needs. • Empower yourself: We give you the basic tools and "must know" information to understand your body and achieve your weight loss goals on your terms. • Follow the equation: Burn 3,500 more calories than you consume, and you lose a pound of fat. No rocket science, no magic. We give you your results every day. Memberships start at just $3.75/week!